Acer has impressed over the past couple of years with its range of high-quality, well-priced laptops. The Acer Aspire 7741G-5464G50Mnkk is a desktop replacement machine boasting a large screen and decent performance; it's just a shame that build quality and a few usability issues mean this laptop isn't quite as competitive as it should be. Such an expensive machine should feature the kind of premium finish sported by the Lenovo IdeaPad Z560 and Asus U36JC, but that's not the case. 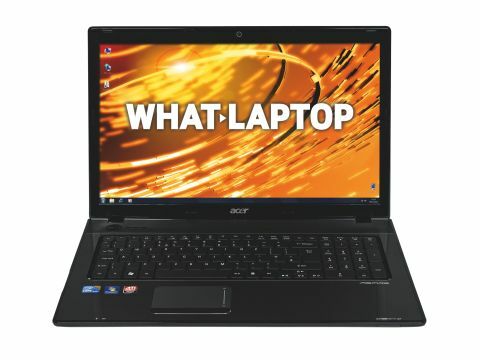 Instead, dull plastics are used, which appear suspiciously similar to the much cheaper Acer Aspire 5552. Nevertheless, the mottled finish featured on the lid makes the laptop easy to grip, while also hiding scuffs and scratches well. Once you open the lid, things get better, and the brushed aluminium palm rest looks great. The 17.3-inch screen features a 1600 x 900-pixel resolution, and its sheer size ensures this laptop will spend most of its time on your desk or around the house as, unlike the Asus U36JC, it doesn't suit regular travel. The picture it produces is great, and will appeal to those wanting to watch movies or view photos. It's highly reflective, however, and creates distracting reflections under bright light. The keyboard didn't quite live up to our expectations, and looking from side on at a low angle, it's clear the board sits at an uphill slope. It isn't uncomfortable to use, but suggests poor build quality, and the regular typist will find either the Lenovo IdeaPad Z560 or Asus U36JC much more satisfying to use. The large, dedicated numeric keypad will please those that regularly input data, though. The Intel 2.53GHz Core i5 460M processor provides impressive power and is on par with rivals such as the HP Pavillion dm4-1101ea. Everyday applications such as word processors and web browsers run with ease, even when multitasking. There's also certainly enough performance on offer for those looking to run resource-heavy multimedia programs, such as music editing software. A powerful dedicated ATI Mobility Radeon HD 5650 graphics card provides excellent graphical performance – though not quite as good as the Samsung P580 – which is great if you're keen on editing your holiday snaps and videos, and even doing a bit of gaming. Due to the large screen and powerful components, portability isn't great, with an average 179-minute battery life. The 3kg weight isn't the easiest to carry around for long periods either, making it clear that the Acer Aspire 7741G hasn't been designed with travel in mind.